I've seen them but for the extra thousand why not go new? 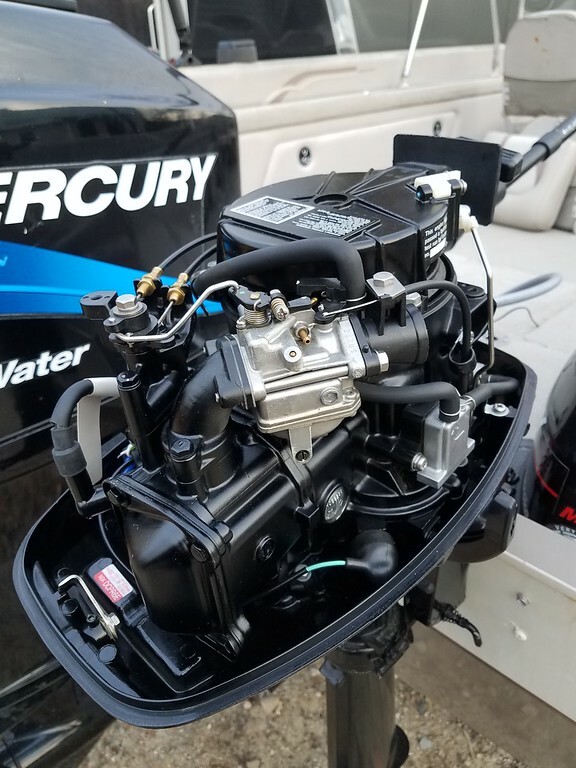 I had a lot of other expenses going on with this "new to me" boat and I saw this and it runs flawlessly so saving a thousand -or in my case more like $1500- I decided to give it a shot. I got that for $800 with a real nice, small tank that I now use on my 14' boat with the 25hp since this is plumbed to my fuel tank. But the fact is these small motors just don't get used hard at all. I mean, I've now trolled at least 200 hours with it since I got it, but before that I bet it was used very infrequently. To me, the warranty is of very little use after the first year. They either work out of the box or they don't and if they didn't the first owner probably took care of it with the original warranty. Then it's just small things like maybe a fuel pump diaphragm or carb rebuild kit but that is nothing for me to save a grand or more. The Pro Kickers are closer to $2800 and even a good, brand new 8hp Tohatsu/Merc was going to run me $2200. But at some point I am going to want power tilt and remote start, so who knows what I will do then. Maybe buy new, but probably not. I once bought a Honda 9.9 4-stroke, with T&T and remote throttle used. I had it on my 25' Sportcraft. Smaller motors are typically not beat up on. As long as the fluids and filters are changed regularly, they will run a very long time. I'm mechanically inclined so warranties don't sell me much. I have looked at a bunch of used, I just haven't found the right price where the savings outweigh being able to break one in myself. Pretty boat Mac! Yeah, nice looking Sportcraft. That's a serious trolling machine! I downsized to the Lund.